I attended the first TFC match in this 2009 Nutrilife Canadian Championship when we beat the Montreal Impact 1-0. Then, things went south and we came into last night's game needing a win by four or more goals to replace the Vancouver Whitecaps atop the final standings. I don't follow soccer that closely, but I appreciate how difficult it is to win by four or more goals, especially when you consider TFC had never ever scored five goals or more goals in a single game. 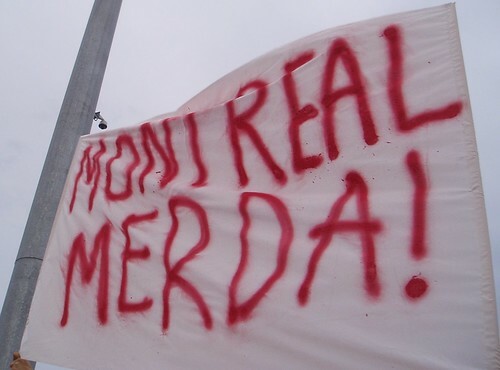 Throw in the fact that Montreal was up 1-0 last night, and you'd be forgiven for writing us off. Queue the miracle. Toronto FC managed to score six straight goals to beat the Montreal Impact 6-1 to take the 2009 Nutrilite Canadian Championship. Dwayne De Rosario scored the first three, Amado Guevara had a couple and Chad Barrett scored the championship-winning goal in the 83rd minute. The Voyageurs Cup is ours. Next up, the Stanley Cup. Ahh.... Mike I wish you and the leafs much success. For a second there I thought you were going to say, "Next up, the Dark Knight". I actually recorded The Dark Knight from TMN earlier this week. It's sitting on the hard drive waiting for me to press play. This time I mean it. Up next, The Dark Knight. We may see a day in the future when the Raptors are top play, FC is number 2 and the Leafs are an aftershow. I'll be waiting for the Fred P commentary on it. I can't speak for Scarborough, but almost all the 7 year olds I know through my son are playing hockey and absolutely loving it. It would make sense that participation would drop in parts heavily dominated by new Canadians. Parents tend to enrol their kids on sports they know. In my life time, I will be shocked if the Leafs aren't always #1 in these parts. Shocked.